Take a thrilling jeep ride through the natural sights of Iceland's south coast on this private excursion. Go off-roading through the Thorsmork Valley, visit the gushing Skógafoss and Seljalandsfoss waterfalls and see the notorious Eyjafjallajökull Volcano. Learn about Iceland's icy and fiery natural environment, home to glaciers, volcanoes, and black, sandy volcanic beaches, through your guide's informative commentary. This private tour includes round-trip transportation in a Super Jeep from your Reykjavík hotel. Meet your private guide at your hotel in Reykjavík, where you'll board a 4x4 jeep that is equipped to conquer even the most rugged Icelandic terrain. Let your guide know if there's anything specific you'd like to see during your tour of Iceland's southern coast; this private tour ensures personalized attention for you and your group. Leave the city limits and do some off-roading through meltwater rivers; enjoy the ride as your guide lets out the throttle for a thrilling ride on the way to Gigjökull. This glacier calved from the notorious Eyjafjallajökull, a glacier-covered volcano that erupted in 2010, halting air traffic across Europe. Continue to Seljalandsfoss, one of the country's most-visited waterfalls. With the proper footwear and a sense of adventure, visitors can trek behind the crashing fall in search of the pot of gold said to exist there. Then head for a hidden canyon lined with green moss, unique Icelandic flora and home to a pristine waterfall. Stop for the included picnic lunch, which you'll enjoy in a striking natural setting. Back in your vehicle, head through the 'trough' areas, places covered by ash fall, now only accessible by specially adapted vehicles. Cross more glacial rivers to get the best view of the eruption site. Brave travelers can come within toasting distance of hot lava rocks. 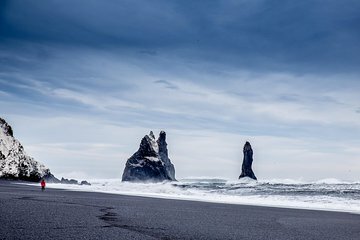 Drive along the dramatic black sand Atlantic Ocean beaches on the way to the impressive Skógafoss waterfall. Return to Reykjavík in time for dinner.